The naturally beautiful surroundings of Colorado mean that couples can choose between rustic charm or the grandeur of an indoor venue, or they could start their life together with snow-capped mountains and lush green meadows behind them. 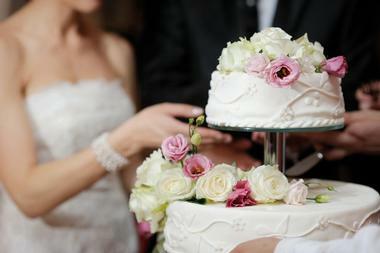 These Colorado venues offer plenty of choice to couples with a wide variety of tastes and preferences. The Garden of the Gods Club and Resort gives couples the opportunity to exchange their vows and start their new life together in front of the red rocks of the Garden of the Gods and the majestic Rocky Mountains. Whether it’s an intimate ceremony or a lavish celebration with 250 of the couple’s friends and family, the resort will be sure to exceed your expectations. Garden of the Gods specializes in extraordinary themed receptions, with personalized menus to match. Services and amenities included in the wedding packages include setting up and taking down the event space, wooden parquet dance floors, plated three-course dinners, cake cutting service, linens, and much more. The Greenbriar Inn is a picturesque restaurant, tavern, and event space that can be found on the foothills of the Rocky Mountains. The space has a fairytale-like setting, with historic remnants from when it initially opened in 1967. The special place is renowned for hosting extraordinary wedding ceremonies and receptions and can be arranged to reflect any theme or style requested. Whether it’s an intimate affair or a grand celebration, the experts at Greenbriar Inn can deliver a seamless experience. Services include a dedicated coordinator, a rehearsal prior to the big day, linens, ample parking, and an experienced event staff that will execute everything to perfection. Della Terra Mountain Chateau takes couples and their guests to a completely different world, one filled with magic and romance. The chateau is considered one of the most luxurious boutique inns in Colorado, and rightly so as the structure is breathtakingly majestic. The surroundings of untouched nature from Colorado Rocky Mountain National Park leaves couples with endless spaces for them to exchange vows and start their new life together. The indoor site can hold up to 200 guests and has lofty ceilings, large arched windows, and a balcony that overlooks incredible mountain views. 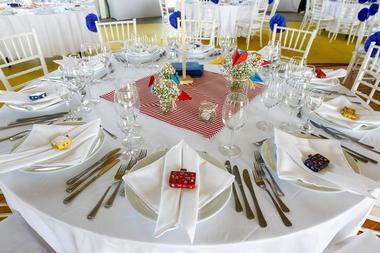 Other aspects include a dance floor, full-service bar, a DJ area, and a gourmet kitchen for the caterer. Often considered Denver’s most unique wedding venue, Moss Denver is an urban industrial space found in the Santa Fe Arts District. 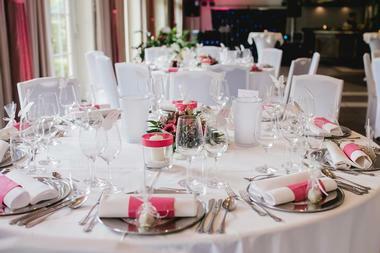 Moss has a contemporary yet warm vibe, and the 1900’s building is a stunning spot for any wedding celebration. There are polished cement floors, factory-style windows, and exposed rafters – all unique touches that will make your wedding photographs stand out. The Chandelier Room is a 3,000 square foot space that can hold up to 200 guests and was named after the impressive chandeliers that hang there. The Edison Room can host up to 160 of the couple’s friends and family and has a unique 10-foot-tall moss-covered rotating wall that is distinctive and unique. Built in 1905, Parkside Mansion is a beautifully restored wedding venue that combines historic charm with modern luxury. 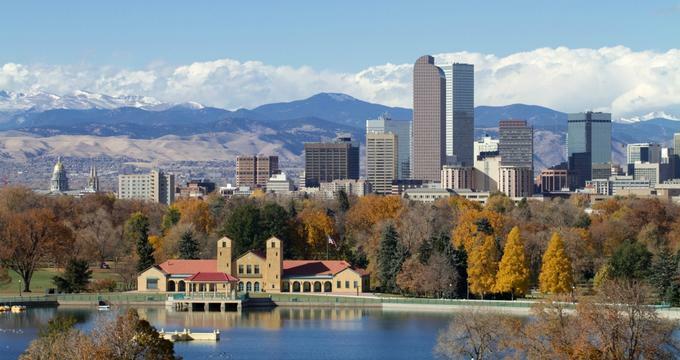 The one-of-a-kind jewel is nestled in the heart of Mile High City and is located conveniently just minutes away from downtown Denver while still offering breathtaking views of Denver’s skyline against the backdrop of the majestic mountain range. The elegant grand ballroom extends to a romantic rooftop patio and is a wonderful setting for wedding celebrations. Additional amenities include tables and chairs, bridal suites, groom’s room, catering prep kitchen, audiovisual equipment, Bluetooth sound system, ample parking, and an experienced professional to guide couples from their initial meeting all the way to the big day. Black Forest is a resort-style wedding venue with a luxurious setting and timeless elegance. Nestled in rural Colorado Springs, the venue is surrounded by towering pine trees, lush greenery, and landscaped gardens. The natural beauty makes for a remarkable backdrop if couples decide to go with an outdoor ceremony or reception. The indoor banquet area offers 6,000 square feet of stunning space fitted with high vaulted ceilings and crystal chandeliers. There are many amenities offered such as a bridal suite and groom’s room, wedding consultation and detail management, and access to several exclusive preferred vendors that are highly sought by couples getting married in Colorado. The Ridgewood Event Center and Gardens is a gorgeous location for couples who want to get married in a Durango venue. The space lies amidst ponds, streams, gardens, meadows, and mountain vistas, making it one of the most picturesque in the state. Couples can exchange vows in a magical setting with panoramic views of snow-capped mountains and 100-year-old cottonwoods in the background. The large interior space has expansive 12-foot-high ceilings and can hold up to 100 guests. 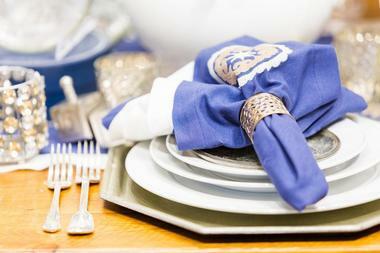 Ridgewood directly provides items such as tables, chairs, linen, glassware, and silverware. 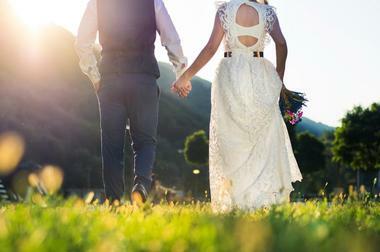 Couples who want a more intimate wedding with up to 50 people can have their celebration at Blue Lake Ranch. Briarhurst Manor Estate is a stunning Victorian English country manor Dr. William Bell, the founder of Manitou Springs, built in 1876. The location is perfect for wedding ceremonies and receptions, including the five secluded acres of gardens and lawns with the Rocky Mountains in the background. Couples can have a fairytale-like wedding where they and their guests enjoy delicious cuisine prepared by the manor’s full-service restaurant. Once it’s all over, the newlyweds will be able to relive their special day repeatedly with the stunning photographs that they take at Briarhurst. Brush Canyon Ranch is a private mountain wedding venue found in southern Colorado. The spacious facility has stunning views of the Eastern Prairies and the Wet Mountain Range, making it a perfect location for wedding rehearsals, ceremonies, and receptions. 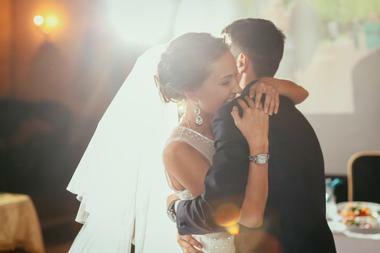 Couples can celebrate their nuptials and dance the night away with their friends and family in the reception pavilion, which overlooks a scenic mountain backdrop. The Brush Canyon Ranch wedding package allows couples to have full use of the facilities for the entire weekend; this includes the gazebo, pavilion, and a two-night rental of the cabin. A unique perk is the draft horse team and carriage available for the wedding processional. Cheyenne Mountain offers over 40,000 square feet of luxurious space perfect for wedding ceremonies and receptions. The inspiring venue has over 200 scenic areas to explore, including an 18-hole golf course designed by Pete Dye. Your Colorado Springs wedding is sure to be authentic and one of a kind; there are five indoor ballrooms for couples to choose from based on the number of guests and the atmosphere they’re looking for. All the outdoor venues at Cheyenne Mountain are increasingly stunning, and couples can celebrate their big day at the beach, the chipping green, grand rivers terrace, quail terrace, the Cheyenne courtyard, or the pavilion. Donovan Pavilions is a stunning timber and stone lodge and wedding venue that is tucked into the mountains of Vail. Whether couples want a small intimate wedding or a larger more lavish one, Donovan Pavilion is a special event space that will always be just right. The pavilion was built in 2003 and has over 5,000 square feet of space that can hold up to 300 guests. There are over 50 acres of open space and park with views and platforms couples can use for their ceremony. 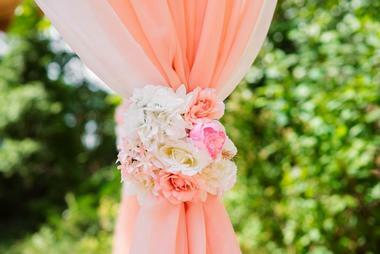 Brides can choose every detail, from the floral arrangements to the caterer. 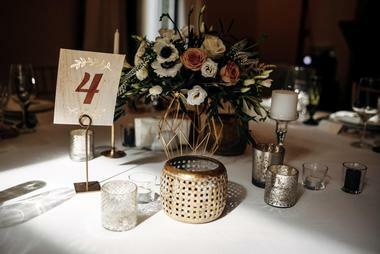 The venue offers tables, chairs, and audio-visual equipment for couples to use. Water engineer Marcus Wright spent nearly twelve years designing and building Dunafon Castle himself. The incredible property was completed in 1941 and was fashioned after ancient Celtic castles from the 13th century. Due to his insight and creativity, couples can now get married surrounded by handmade light fixtures, thick rock walls, arched ceilings, and pivot windows that come together to create a magical wedding venue. There are many outdoor ceremony sites on the stunning seventeen-acre setting, including one next to the crystal-clear waters of Bear Creek. 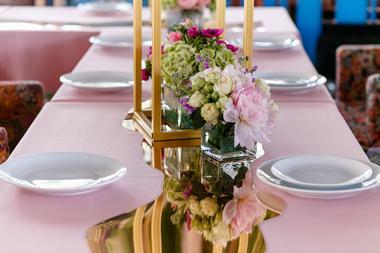 All events at the castle include an event manage who will help coordinate with vendors to make sure everything is executed flawlessly; it also includes a custom tent with chandelier and cathedral windows, valet service, and tables and chairs. Flying Horse Ranch comprises 1,400 acres of lush rolling mountain grasslands that create the perfect backdrop for a memorable wedding ceremony and reception. The scenic location can be transformed into a couple’s dream wedding with the help of their expert venue operations staff. While there are many magnificent outdoor spots for ceremonies, the 14,000 square foot Ranch House is an impressive venue for receptions; it includes the Great Room with gas fireplace, formal buffet room, gourmet kitchen, and a complete bridal suite and groom’s quarters. 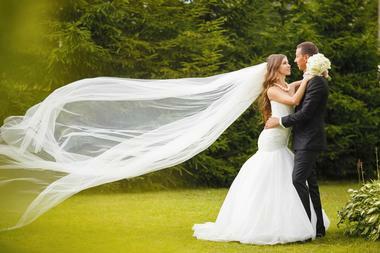 There are packages for small private weddings as well as lavish celebrations with up to 200 guests. The unique blend of historic heritage and contemporary luxury make Hotel Jerome one of the most elegant wedding venues in Aspen, Colorado. The hotel has a classic setting that provides magnificent views of the Elk Mountain Range, ideal for the moment when couples exchange their vows. The above-ground ballroom makes for an effortlessly elegant wedding space that the bride, groom, and their guests will remember forever. The 3,450 square foot Grand Ballroom has high ceilings, detailed windows, and a neutral color palette that will go with any theme or decor you have in mind. Couples who want a more intimate wedding can be ensured that Hotel Jerome will take all the stress out of the planning process so that they can truly enjoy their private ceremony. One of the favored wedding venues in Grand Junction, Mountain View Farm offers beautiful indoor and outdoor space for wedding ceremonies and receptions. The farm has an isolated and private environment, while only being a short drive away from Grand Junction. The breathtaking views of Grand Valley make for an incomparable backdrop when the lovebirds exchange vows. The farm was originally built in 1903, and though many remodels and additions have been made, couples and their guests can still enjoy the feel and beauty of the original setting. Events for anywhere from 50 to 200 guests include perks such as use of a bridal room, rehearsal space prior to the event, parking, security, and much more. The stunning wedding venue Richards-Hart Estate can be found tucked away in the historic Wheat Ridge neighborhood in Colorado. The site consists of three acres of beautifully manicured grounds and an elegant Victorian estate, making it perfect for both indoor and outdoor celebrations. Couples can start their new life together surrounded by their loved ones in a classic atmosphere that exudes old world elegance. The Estate can house up to 75 guests and includes perks such as separated bride and groom’s rooms, an outdoor wedding arbor and ceremony site, a catering kitchen, and scenic outdoor backdrops for stunning photographs. Lush gardens, attractive architecture, spacious ballrooms, and manicured grounds – couples can find all this and more at the award-winning, all-inclusive wedding venue, Stonebrook Manor Event Center and Gardens. The space was designed with wedding ceremonies and receptions in mind, so every room and every piece of decor is there to ensure a lively and memorable wedding. 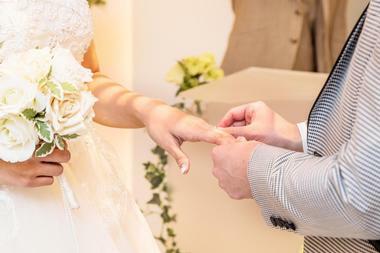 The experts at Stonebrook Manor have years of experience and will work with couples to customize a perfect day that is unique to them. All the wedding packages include in-house catered menus, customized setup and tear down, and luxurious rooms for the bride, groom, and their wedding party. Tapestry House provides a historic and unique setting for an authentic Colorado-style wedding. The charming manor that stands today is a reproduction of the original and was built in 2002 with pieces salvaged from the ruins. It sits amongst 40 century-old trees on truly breathtaking property. Their outdoor ceremony site amidst a garden filled with honeysuckle and lilacs that provide a perfect setting for the romantic moment. The separate reception pavilion can be opened out to the terrace for couples and guests to enjoy the night away. There are five customizable wedding packages to choose from, all of which were created to combine value, service, and convenience. The Lodge at Breckenridge is nestled on a forested cliff at 10,200 feet and offers a stunning Rocky Mountain wedding. The spacious lodge has a luxurious event space that transforms any wedding celebration into a winter wonderland. Couples can exchange their vows surrounded by their loved ones near snow-capped mountains and in the brisk, fresh air of the mountain venue. The space is idyllic for intimate elopement-style weddings; couples can spend their special day and the consequent honeymoon hiking, biking, white water rafting, or just relaxing in the spacious luxury homes while being pampered with therapeutic massages and spa treatments. 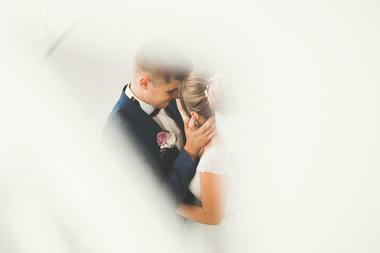 The Loft Music Venue can make all wedding dreams come true, no matter how unique. 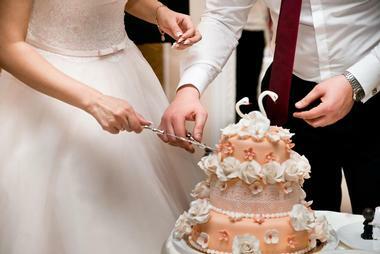 The event staff and coordinator ensure that your special day goes exactly according to plan. The versatile space offers multiple package options, all of which can be personalized to the needs and wants of the bride and groom. Packages can include the chic bridal suite, an additional space for cocktail house, photo booths, photographers, decorators, and much more. It is one of the most scenic wedding locations in Colorado Springs and can accommodate up to 140 guests for a lovely catered dinner. 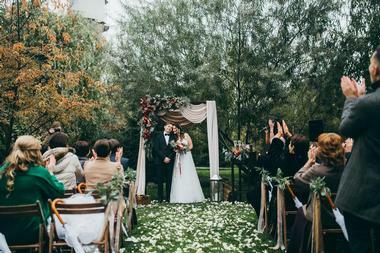 A magical wedding ceremony and reception at The Manor House will be nothing short of perfect. The space is elegant and romantic and includes six acres that are solely dedicated for the use of the bride and groom on their big day. Couples can have an outdoor ceremony against the theatrical backdrop of Dry Creek Canyon or an intimate and cozy celebration near one of the large fireplaces in Manor House. The dedicated and experienced onsite event manager will guide the couple through creating and personalizing the wedding of their dreams. 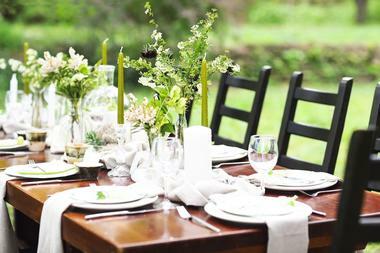 Manor House can accommodate up to 200 people at the exclusive, retreat-like venue. The Pinery at the Hill is a privately-owned wedding venue that opened in 2005. In a short time, it was identified as one of southern Colorado’s premier destinations for resort-style weddings filled with luxury and enchantment. The five-star service offered at The Pinery turns wedding ceremonies and celebrations into an incomparable and beloved memory for the bride, groom, and all those in attendance. The Tuscan-style, award-winning venue has an elegant chapel, two distinguished ballrooms, an intimate terrace, and stunning panoramic views of Pikes Peak and the Colorado Springs skyline. 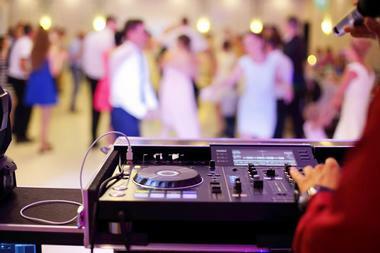 Each of the wedding packages offered includes gourmet cuisine, spacious dressing areas for the bride and groom, a professional DJ, and a state-of-the-art audiovisual system. Viceroy Snowmass is a luxury resort, hotel, and wedding venue that sits right in the middle of one of the world’s finest ski mountains. 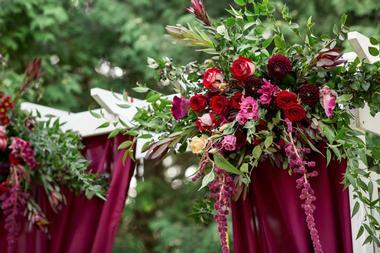 Whether it’s an intimate wedding with just the bride and groom or a lavish extravaganza with 300 friends and family members, Viceroy Snowmass has it covered. The Rocky Mountains and Snowmass Village make for a stunning backdrop for couples to share their vows and start their new against. With so many spaces on the property, couples can choose from a regal feast to a rugged celebration when planning their wedding. Other services provided include blocked guest rooms, access to an elite list of vendors, and event management to make sure all the events unfold seamlessly. Located just south of Denver, Villa Parker is one of the most stunning wedding venues in Colorado. Often described as “where Tuscan charm meets the Rockies,” the space gives visitors the perfect combination of rustic charm and vibrant elegance. Everything from the grand entrance of the Mediterranean estate to the lush gardens adds a luxurious detail to each wedding celebration. Couples can choose between indoor and outdoor sites such as the endless archways or the romantic courtyard. 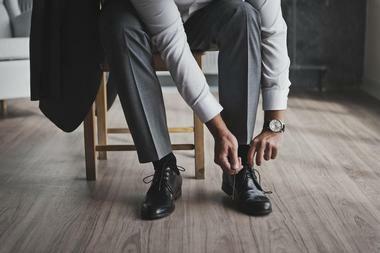 Amenities offered with wedding packages include access to a bridal suite and groom’s room, rehearsal space, linen, china, and audiovisual equipment. The event space to accommodate up to 200 guests. The Wellshire Event Center has been one of Denver’s landmark wedding venues since 1926. The space is located on the gorgeous Wellshire Golf Course and is just minutes away from Downtown Denver. The experience the venue has gained over the years has made it popular with brides; so much so that it has been given the “Couple’s Choice Award” by WeddingWire and picked best of weddings by the Knot. The dedicated staff makes sure that everything is executed exactly as the bride and groom want and can handle everything from small, private affairs to grand weddings. The full-service event center has many different options to for brides to create a personalized menu, including full Kosher meals, and can add features such as horse drawn carriages, special lighting, or a limousine.